Lennie Waite was born in Paisley, Scotland to two English parents. Her early childhood was spent in Glasgow, Scotland, Geneva, Switzerland, and then Austin, Texas. She first started running at the age of 5 and though she enjoyed it and experienced success at a young age, her passion for running competed with her passion for football or “soccer” as it is called in America. Lennie continued to juggle her two athletic passions all the way through high school, competing at varsity level in both sports and recruited by colleges for both activities. She ultimately made the decision to stick with soccer and started at Rice University on a soccer scholarship. Fast-forward to a few years later and Lennie decided to walk onto the track team at Rice University. The Rice track team created an environment that allowed Lennie to thrive and develop into the track athlete she is today. She had found her niche and experienced rapid success in the steeplechase. 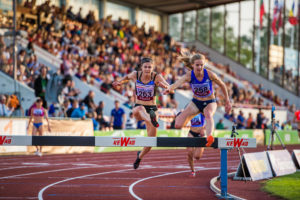 The steeplechase is an event that plays to her strengths, allowing her athleticism that made her such a good soccer player to complement her endurance and ability to hurt. While at Rice, Lennie made it to the NCAA final in the mile (2009) and steeplechase (2009), and earned All-American honors in both. Upon graduating from Rice University, Lennie decided to continue to train and test her limits on the track. She improved her personal best in the 3000m steeplechase to 9:35 this season, securing an Olympic qualifying mark and grabbing a place on the British Olympic Team. Lennie is currently in Belo Horizonte, Brazil with Team GB, preparing for her prelim in the 3000m steeplechase on August 13th. Lennie, what do you attribute your long-term success to? I’m lucky to have grown up playing a lot of sports. My parents encouraged me to participate in many sports, and this multi-sport background helped me become a stronger athlete, and also prevented me from burnout in one specific sport. I competed in gymnastics, basketball, volleyball, soccer, swimming, and running. I even tried tennis and golf, but it was pretty obvious early on that I didn’t have the finesse required for those sports. I also spent time snow skiing, snow boarding, water skiing, and wake boarding. I think doing so many sports and being a really active child provided me with agility, power, and strength, and exposed me to a variety of competitive environments where both individual performance and teamwork played a big role. Growing up in different sports excited me and I continued to crave competitive opportunities. I think a lot of children specialize at a young age, and experience dips in performance, burnout, and then chose to leave the sport. Also, all of these different sports provided me with a strong foundation for running, and specifically, the steeplechase. I am also lucky to have had great coaches, mentors, and supporters over the years. Although I am alone on the track running, I would not be out there if it wasn’t for my family, coaches, and physical therapists. Having access to Katie and Pieter at Mondo Sports Therapy has helped me dodge many potentially long lasting injuries that can lead several athletes to end their career. What is it about the Steeplechase that you love so much? The added elements of the barriers and water jump make the steeplechase a more exciting event. I like the agility and coordination that the steeplechase requires. Also, the barriers break up the race and give me something else to think about. I think spectators would agree that it is exciting to watch athletes navigate the barriers. Everyone loves to see a good steeplechase fail! What does training for the steeplechase look like? I run about 80 miles a week in the fall and winter—I like to put together three weeks of 80 miles, and then a recovery week, which is normally 60 miles. Once April comes around, my mileage starts dropping because the intensity of my workouts increases as the track season approaches. During racing season, I run anywhere between 50-70 miles, depending on the week. I try and keep a 16 mile long run in my weekly schedule for as long as possible. However, once summer racing season comes around, I generally drop my long run to 12 miles. Training for the steeplechase looks a lot like training for the 1500m or 5k. I have a good mix of endurance/strength sessions and speed work. 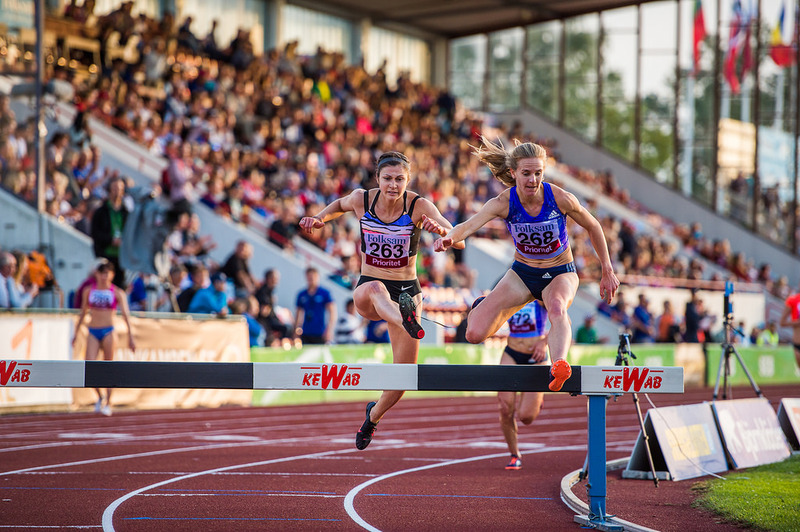 In my opinion, the thing that differentiates a steeplechaser is their excitement when a coach first presents the opportunity for them to run AND jump over barriers. I think successful steeplechasers naturally gravitate towards the event because they think it looks fun and they have a natural ability to clear the barriers. I spend time doing hurdle drills, and I start incorporating some hurdling into my track sessions in late March. However, I spend more time focusing on improving my endurance and strength as a runner vs. perfecting my hurdling and water barrier technique. The best way to stay healthy is to prevent the injury from occurring. I am a big supporter of being pro-active with my physical health and having routine sessions with my physios so we can stay on top of any aches and pains that pop up during my training. I have learned my weaknesses over the years, and I spend a lot of time each week doing ‘pre-hab.’ I am very lucky to have physical therapists that understand elite running and the type of work that it takes to keep a body that runs 80 miles a week and jumps over barriers healthy. I get physical therapy at least once a week to make sure that my body is moving functionally. Spending time getting strong is definitely worth it, and it has helped me string together several successful track seasons. What is your advice to aspiring young athletes? Get strong! I think that it is so important to build strength and agility at a young age to help young athletes develop fully. I am against specializing in any one sport at a young age. I think it is important to try all sports, learn what you love, what you need to work on, and experience teamwork and individual sports. Also, don’t be afraid to fail! Learning how to overcome failure and disappointment is one of the most important attributes of becoming a long-term, successful athlete. Resilience is key! How has your Olympic experience been so far? It has been amazing. I spend most of the year logging high mileage weeks, doing strength work and physical therapy, and pushing my body to the limits. A lot of this work is monotonous, tiring, and far from glamorous. However, making the Olympics is probably the most glamorous experience in track and field. I have been so well taken care of and fans have taken a real interest in my buildup to the games. It feels very special. How do you keep yourself motivated to train day in and day out year after year? I am lucky in that I love to run. I also have a great support staff in my family and friends who help keep me motivated to run. A lot of training involves long, easy runs, and I always try and meet up with friends for these runs. It makes it a more social experience and much more fun. Most of the winter, I ran with a group of guys for my long run. Their conversations and jokes during the runs made me excited to wake up on Sunday morning and log 16 miles. I also have great training partners and I try and have as much fun as possible during the warm-up and cool down process. Company makes everything so much easier and is a big motivator for me. I also love challenging myself, and seeing how much I can improve in an event. Future races that are on my schedule really motivate me to train hard. I think it is important to target a competitive opportunity to show off all of the hard work. What, in your opinion, is one misconception about training/running? Wow, there are a lot. The most common question I get asked is “What have you run in the marathon?” Olympic caliber distance runners hate this question. There is a big difference between running on track in the Olympics and training for a marathon. Although most track distance runners could run a very good marathon, it would be detrimental to our Olympic dreams to try one too early. It is very hard to explain this to community runners. I also think a lot of people overlook all of the little things that it takes to be a great runner. It is not only about logging miles, but also about becoming stronger and doing the ancillary work. Runners can gain a lot by working on balance, power, and stability. Great runners are also strong athletes. Do you have any superstitions before you race? I don’t. As a professional athlete, you have to travel so much for races. You are never guaranteed access to a certain food, your own bed, a full night’s sleep, or other little comforts that you may be used to prior to races. I learned pretty early on in my career that it is best to go with the flow of the environment that you’re in. There are too many things that are out of my control on race day, so I try to focus on the things that are in my control. For example, I can control my warm-up routine, and I like to implement the same warm-up before races.